Demand on BC Hydro’s electricity system grows each year. From March 2004 to March 2005, BC Hydro connected about 22,000 new customers to its system. BC Hydro’s latest demand forecast shows an increase of 1.5 per cent growth per year over the next 20 years. Now halfway through that 20 year estimate, the utility’s public records show that, instead of rising 18% by 2016, domestic consumption declined by 3%, comparing the current year’s demand to when the Service Plan was published. 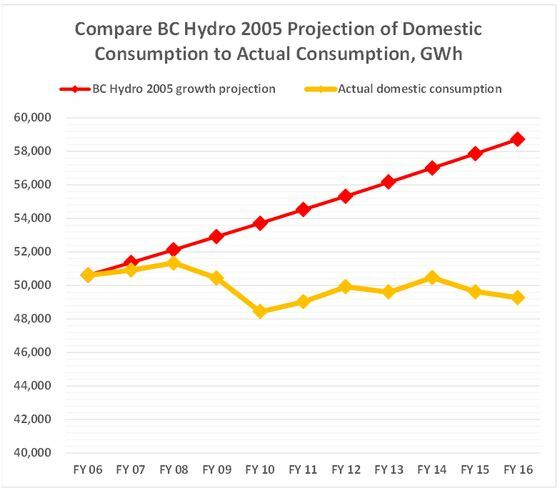 In 2012, BC Hydro ignored its own data and raised the annual growth projection from 1.5% per year to 1.7% (40% in 20 years). Charles Reid, then BC Hydro President, repeated that assertion in 2014, mouthing a long standing claim that consumption growth is inexorable. He was clearly wrong and probably knew it. A decade of flat demand for electricity in British Columbia is in line with numbers reported by the U.S. Energy Information Administration (EIA). 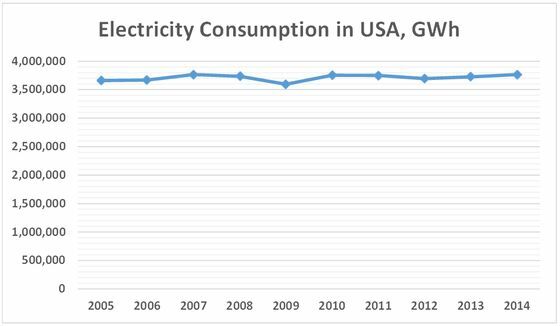 Growth in electrical consumption throughout most of North America has been non-existent since 2010. EIA reported in 2014 that U.S. electricity sales had decreased in four of the previous five years. Part of this is from less heavy manufacturing, part from user’s desire to conserve energy and part from increased efficiencies of new technologies. The International Energy Agency reports that North Americans consume double the energy per person of residents in other OECD nations. Per capita, we use nine times the amount of non-OECD countries. BC Liberal politicians wrongly choose policies to encourage more consumption instead of more conservation. They are concerned about rewards for friends in the here and now and that means billions borrowed to be spent on new power generation that may or may not be used. Laboratories around the world are working on new energy and solutions are beginning to emerge that will create a revised landscape not based on fossil fuels and waste. …The battery storage systems developed with Arpa-E’s support are on the verge of transforming America’s electrical grid, a transformation that could unfold within the next five to 10 years, [Ellen Williams, Arpa-E’s director] said. The most promising developments are in the realm of large-scale energy storage systems, which electricity companies need to put in place to bring more solar and wind power on to the grid. She said projects funded by Arpa-E had the potential to transform utility-scale storage, and expand the use of micro-grids by the military and for disaster relief. Projects were also developing faster and more efficient super conductors, and relying on new materials beyond current lithium-ion batteries. As requested by Les in comments, here is the price change of power purchased by BC Hydro from IPPs. As indicated, prices decline elsewhere but in British Columbia, rise 42% in five years. In my mind that is a big problem. She was Deputy minister to Gordon Campbell during the time the Clean Energy Act was formulated. The CE Act is a massive giveaway to IPPs at BC Hydro's expense. Well, when you can't find a list of former CEOs you don't need a long memory. Who would ever state, they were not “the right person for the position” “Right” is the key here; right for what, who, why? Guy is right; big problem. Had to consult a dictionary in the very first line. Nomenklatura: a select list or class of people from which appointees for top-level government positions are drawn, especially from a Communist Party. Interesting. Although the BC Business Party declares itself to be our protector from the socialists, they just can't help operate as if they are most comfortable with centralized totalitarianism, engaged in ceaseless political maneuvering among themselves while maintaining total power, as a privileged class, over all the others. Thus, they serve state owned enterprises of China and Malaysia ahead of businesses owned by Canadians. Those Asians understand how vital it is to treat the decision makers with discrete generosity. 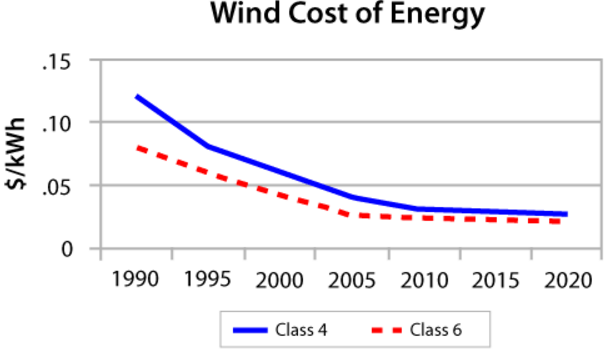 Norm, run that graph you did of the rising price per KWh paid independent power producers. While cost per unit of electricity declines elsewhere in the world, it rises quickly in British Columbia. That last graph, does it include the low price paid to Alcan for Kemano power? 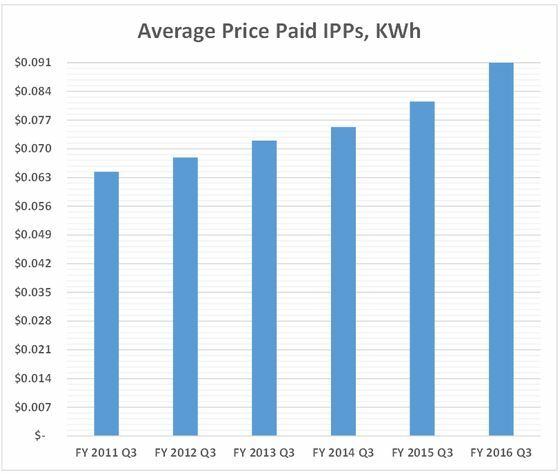 Yes, it is the average of all IPP purchases, including contracts that date back many years. All amounts are as reported by BC Hydro in 3rd quarter reports for each of the fiscal years noted. Easy to understand why the BC Business Party keeps the IPP contracts a secret. It is clear that additional power is not needed to meet current and regularly anticipated demand. However, the Liberals are determined to build more generating capacity of its own AND continue increasing purchases from present IPPs and the large number of private facilities that are being added. All of these sources will cost more than 10 cents a KWh, which is about double what large industry was paying until the Liberals offered it for free. Now we hear that BC wants federal infrastructure grants to go, not to rapid transit or coastal transportation, but to the construction of power lines to take electricity from various generating sites and deliver it to the NE gas fields and remote mine sites. So, not only will taxpayers subsidize BC Liberal friends by buying expensive power and delivering it resource industry customers, we will divert money away from desperately needed facilities that serve people to to business operations that offend the environment and add very few new employment opportunities. British Columbia is like a ship that is headed for disaster and, instead of dropping anchor or steering away, Christy Clark's government is cranking up the throttles and hoping that when it hits land, the ship will turn into a train. What would the public say if instead of using its own fleet, BC Ferries tied most of it to the dock while it leased ferries from private interests at a cost far above what it costs to run its own fleet? What would it say if it was known that the leasing companies were set up primarily by well-connected BC Liberal cronies, some who were still reaping the benefits, and others who quickly flipped the leases to foreign interests at huge profit? What would it say if BC Ferries charged companies that were big BC Liberal campaign donors reduced rates on the ferries, made the general public pay full rates that increased yearly, but never enough to cover the difference, which is moved off as deferred debt to be paid by our grandkids? I doubt the public would stand for it. But what if BC Ferries also said that despite the existing massive public debt it had created by operating this way, and estimates that traffic would remain flat for years to come, it was going to build another fleet of ferries at a cost of somewhere north of $10 billion, and continue to ignore its existing and capable fleet while leasing more expensive ferries on a very long-term basis? I’d like to think the public would be even more rightly outraged. But I must be wrong. BC Hydro does the same thing with electricity, and other than some mild annoyance at the thought of a 4% increase on their Hydro bill, the general public is largely silent. “Sure, but there's no real alternative” he laments. I've been listening to this BS for years… And ANYBODY(even if they work for BC Liquor Distribution) who says something like this is a supporter of the BC Liberal Party and definitely deserves to have to pay $400 – $600 dollars a month for Hydro within the next 5 years. The $56+ billion that BC Hydro owes for power from IPPs will not go to expanding or upgrading BC Hydro's own infrastructure. I believe that the first thing a non BC Business Party, elected government must do is rescind all contracts, not in the public interest, by order in council. Of course Site C, would be shut down, until a BCUC review and full economic, First Nations impact and “full, scientific based” environmental review is done. The compilation of evidence necessary for a Corruption enquiry must then be done, and once the facts are known, an enquiry called, mandated, an outside authority engaged as a chair, and the the enquiry commenced. The path to the future is known, the political will must be found to do this…its no longer about the cost, its about integrity in governance and Democratic accountability. So.. the NDP are socialists? What does that make the BC Liberals…think real carefully on this one. The BC Libs will say or do anything, to discourage folks from the NDP. The truth, socialist parties in the rest of the world ensure social license, social responsibility, fair wages, and balanced, managed and regulated governance. Debt by private industry is “not” socialized, onto the backs of the public. Tax dollars are used in a responsible, ethical and accountable manner. That is an excellent point….nor will it go to keep employees (most of whom are PEng's or high end journeymen that really have a “utilities background”) on staff . I think some of those B.C. Lieberal/Hydro guys live in an other reality. ah, well the voters put them in office and now they can live with the results. if the province goes bankrupt such is life. Thanks for the research and revealing charts Norm and for all the 'eclectic' comments. Lew' BC Ferry analogy is simply brilliant… if people can not connect these dolts – they never will. BC Hydro's Burrard Thermal natural gas plant can produce a lot of power. 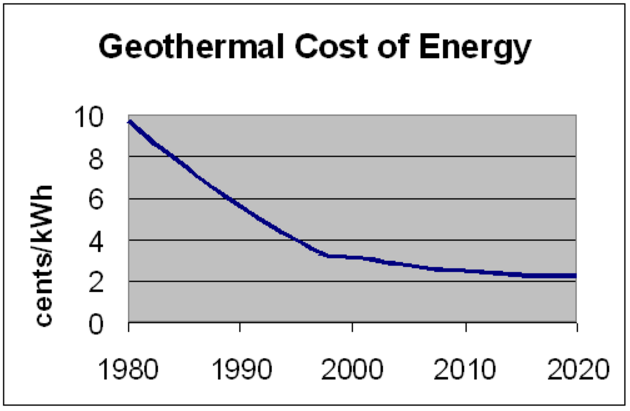 However, the BC Clean Energy Act states that Burrard Thermal is not to be used, except in certain circumstances. Jessica McDonald was Deputy Minister to Premier Campbell in the years leading up to the Clean Energy Act coming out in 2010. Assuming, as the BC Govt claims, power demand in BC is growing, foregoing power from Burrard Thermal means more power is needed from BC IPPs, such as Innergex. See my comment near the top about Innergex and Jessica McDonald. Ms. MacDonald was on “Voice of BC” with Vaughn Palmer on Jan. 14, 2016, extolling the virtues of Site C.
I'd bet she got very few difficult-to-answer questions. Palmer has been helpful to IPPs in the past too.